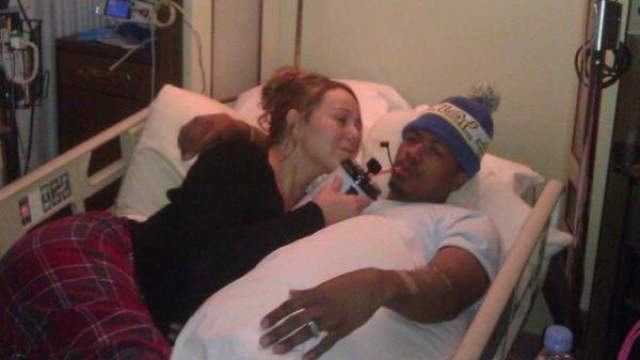 Recently, Mariah Carey began asking her fans to spare a thought and prayer for her husband Nick Cannon, who was hospitalized in Aspen. Carey revealed the news on Twitter, where she then posted a picture of her husband in a hospital bed showing off her loving bedside manner. She’s holding a sippy cup with a pink straw next to him as he looks quite disgusted and ill.
“Please pray for Nick as he’s fighting to recover from a mild kidney failure #mybraveman,” she tweeted prior to elaborating on the “serious moment” in a blog post, according to an article in E! Entertainment. Funny to think that just a year ago the roles between the two were reversed. Mariah was hooked up to plenty of machines after having dembabies. Nick stuck by her side through it and now she’s trying to do just the same. Mariah wrote also later on that they are attempting to make the best out of the situation, but didn’t reveal the timeframe for Nick to be in the hospital, what kind of condition he was in, or if he was making any progress. Well, Nick, from us to you, we hope that you’re feeling better soon. Let us know how the snow is in Aspen when you get a chance.